I can't remember where I read about Councils and Contracts but I do love a good city building game and other than Suburbia and The Capitals, I have not yet found another good city game. I managed to get a review copy from the publisher and brought it out for a few games with my new school mates. 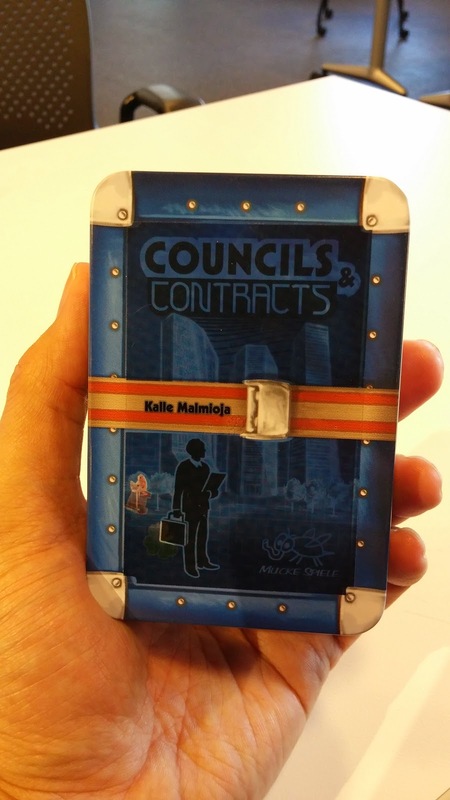 Councils and Contracts is a game published by Mücke Spiele in 2013 and is the first game by designer Kalle Malmioja. In it, players vie for the resources from the different councils so that they can get and construct buildings which will give them points and additional actions. When the game ends, there will be some final scorings and whoever has the most points will win the game. The game came in a small little metal box and when opened, it was packed full of stuff. My box was slightly dented though and that may affect how well you can store the items back in. There were cards and meeples and plastic discs and I don't believe there is much room left so careful packing is required after every game. The box colors is questionable because from afar, you cannot really see the name of the game. The box art is interesting though because it looks like a metal suitcase. But what that means to the game is lost to me. Packed very neatly to fit it all in. Player aid stuck on the inside of the box. No sleeving for me! When you first get it, you are asked by the manual to do a few things. Firstly, line up the score track and then add tape to their backs so they remain in place. You are also asked to do that for the resource cards that each player has. This is kind of surprising to me because I am not too sure how they will fit back into the box again after the taping. I did not tape mine because I wanted to fit it all back and did not want to spoil the cards. Because they wanted to fit everything back into that small box, everything is kinda tiny. The meeples are the normal size though and cards I think are mini-euro sized. Its not a big issue but just have to be mindful if you like to sleeve your cards or bag your stuff. You could easily transfer it to another box to play though. How does the game play? The entire game revolves around 5 resources as you can see in the image above. 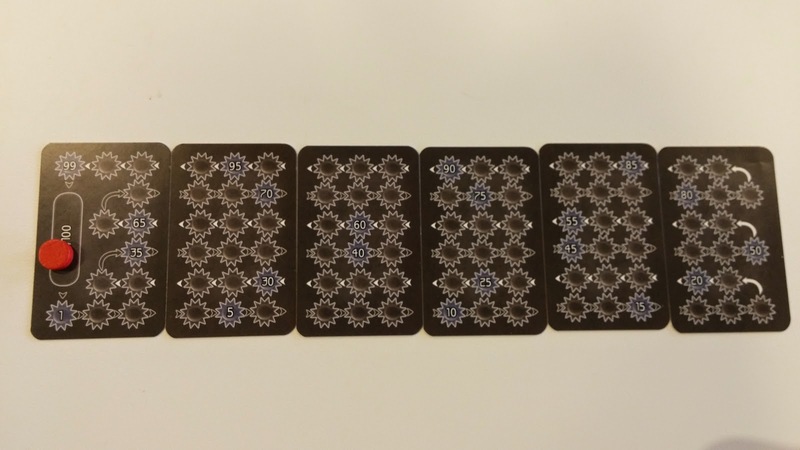 The last card's resources can only be obtained via some special buildings whereas the rest can be obtained from the 4 available council cards. In the rules, they suggest that there will be expansions where some of the cards in the box will then be used but for the base game they can be omitted. The main unique mechanism of the game is the concept of you having meeples or not at the start of your turn. If you have, then you can only choose from placing meeples into the councils or constructing a building card from those that are available. 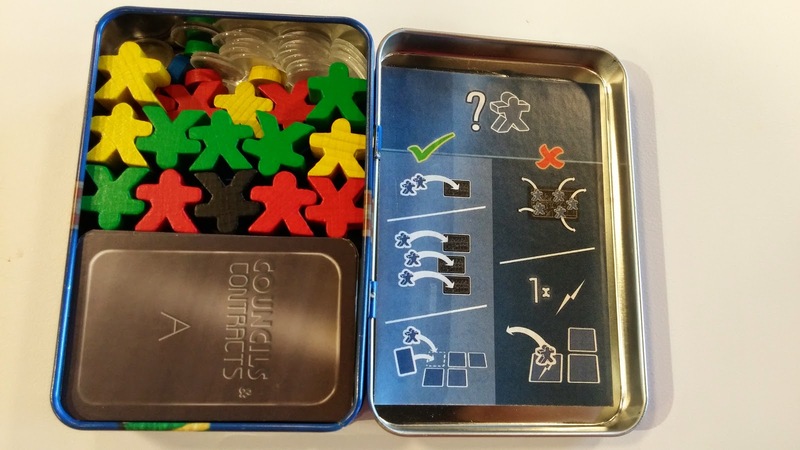 Otherwise, if you have no meeples at all at the start of your turn, you can resolve a council card or activate a building where you still have meeples on. Let me elaborate. Placing meeples and then resolving them is the only way to get resources in this game. You can either place 2 meeples into 1 council or 1 meeple each into 3 different councils. This functions as a means to get resources OR to empty your meeple stock because the only way to get those resources OR activate a building requires you to not have any meeples at the start of your turn. You can also construct buildings by reducing those resources in front of you and then placing the building card into the center where at the start, there will only be a town hall. You will get points from the building. 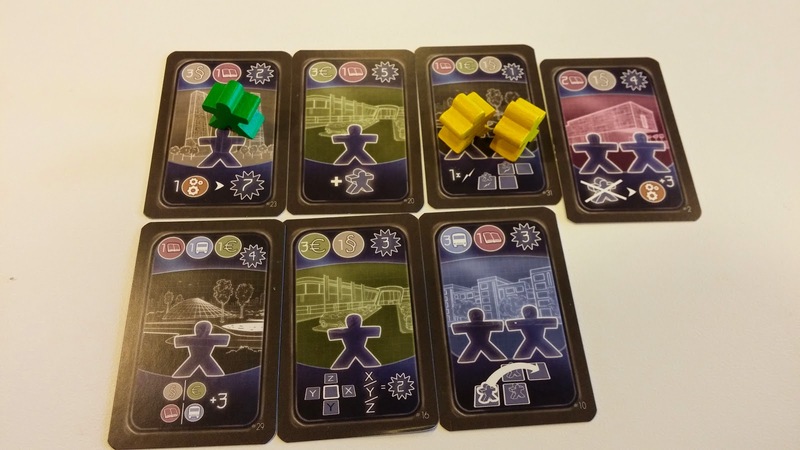 The building you build will usually require 1 or 2 meeples which you have to place from your stock when you build (and you must have that many from your stock else you cannot build). So there is already a level of strategy here because you maybe planning to empty your stock as fast as you can to activate a building yet do not want to be screwed if another player empties that council, thus making your move inefficient. Removing meeples from the council will depend on how many meeples you have on it. You will automatically get 1 of that resource when you choose to resolve and then if you have 2 or 3 meeples you get that many resources. If you have 4, then you get 4 points AND 1 resource of that type. In addition, all other players' meeples get returned back to them and they will get resources, if they have enough meeples on the card. This allows you to potentially sabotage another player because he may not have enough meeples to get anything useful from the council. OR if he was planning to activate a building next, he cannot do so now since his meeple(s) had been returned to him. You can also choose to activate buildings and this happens by moving the meeple on them back to your stock. The buildings have several abilities. Some change resources for you while others give you points or extra meeples. 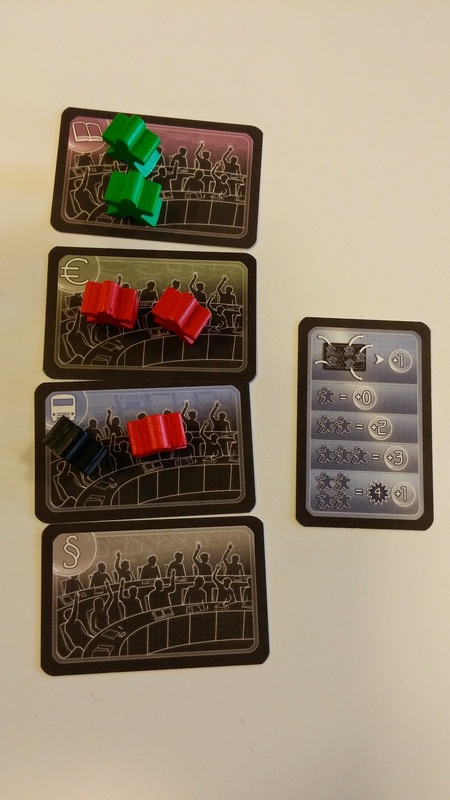 There is one particular card that seems to be quite powerful by locking your 2 meeples on them but allowing you to activate ANY occupied building on the board, even if they aren't your meeples/building. Careful activation of buildings can determine if you win or lose the game. We did run into some problems because some buildings had powers that seem to contradict with the powers of others. The rules, while does a good job of explaining the buildings, does not handle a lot of the exceptional cases. It is quite a straight forward design and seems quite balanced. There are maybe one or two buildings that seems a little overpowered but I am not sure if I should have included them into the basic game or if they are meant to be included in the expansion. The theme can be replaced with something else but the mechanism is quite interesting. There are quite a lot of opportunities for screwing your opponents but I think you will need several plays to be able to appreciate it better. Its light-medium weight game and you can play it simply as getting resources and building stuff but to play well, you will have to observe what your opponents have and then play accordingly. Ultimately though it does not feel as if there is any climatic moments in the game and there is not much luck since everything is open information so this would be a euro-style game in my books. 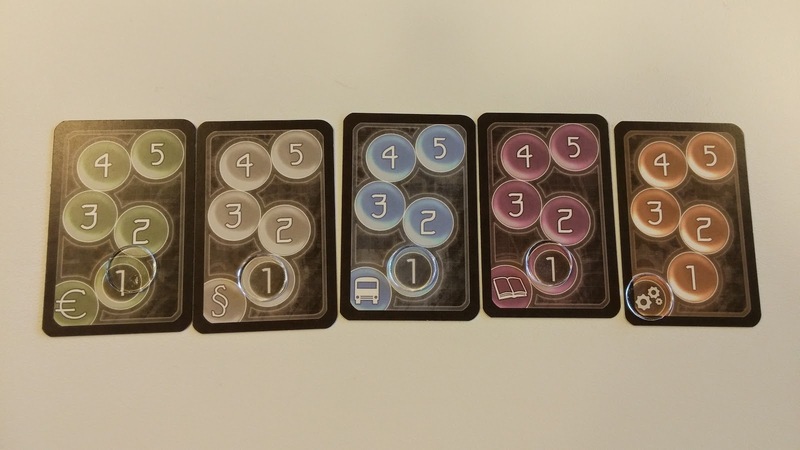 I did not get a feeling of building a city other than the central area where the building cards are just keeps expanding. The buildings themselves don't have names and have generic art on them plus the powers does not corresponding thematically so that's a miss for me. I will say TRY IT BEFORE YOU BUY.